RONNY DEILA saw his aspirations of Champions League credibility as Celtic manager suffer another severe blow as he oversaw the Parkhead club’s first ever European defeat to Swedish opponents. The damage to Deila’s reputation is open to debate, but there is little doubt the Norwegian coach is diminished as a consequence of suffering a second successive failure to lead Celtic into the group stage of the tournament. 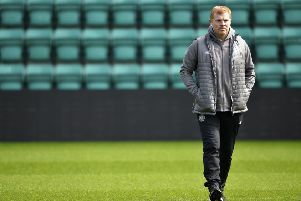 The financial cost to the Scottish champions is easier to measure as they come to terms with taking a hit of around £13 million this season for dropping instead into the group phase of the Europa League. They will rue the fine margins which ultimately decided this play-off round tie and were rightly incensed by Serbian referee Milorad Mazic’s decision to disallow a Nir Bitton goal after a clear handball in the penalty area by Malmo defender Kari Arnason. The controversy came as Malmo led 1-0 through skipper Markus Rosenberg and the Swedish champions took full advantage, Felipe Carvalho netting a second early in the second half. But Deila and his players must also look to their own shortcomings, most conspicuously the weak defending of corner kicks which gave Malmo their stoppage-time goal in the first leg at Celtic Park and contributed to both of those conceded last night. The compact but remarkably atmospheric Swedbank Stadium had been whipped into a cacophony of sound by the time the action kicked off, with the 1,000 travelling fans doing their level best to try and match the decibel levels of the frenzied Malmo support. The noise was translated into a suitably frantic start to proceedings with a ferocious tempo being set by Age Hareide’s men which would provide the momentum for Rosenberg to give them the breakthrough they craved. Before he struck midway through the first half, Celtic had appeared to be handling the occasion reasonably well. Deila’s first big call of the evening had been to hand Saidy Janko his European debut, the 19-year-old Swiss preferred to the more experienced Efe Ambrose for the right-back role after Mikael Lustig failed to recover from his hamstring injury in time. Janko betrayed no sign of nerves, immediately showing an eagerness to join in with the attack. Celtic almost made the perfect start as a result of Janko’s surge forward in the second minute as he picked out Leigh Griffiths with a low cross. The striker couldn’t connect cleanly enough, however, and his close-range shot was blocked by Rasmus Bengtsson. Malmo’s first-leg hero, Jo Inge Berget, delivered his team’s quick response, finding space on the left edge of the penalty area to curl a shot narrowly off target. Charlie Mulgrew had been selected ahead of Emilio Izaguirre at left-back in a bid to provide greater defensive discipline in that area but the Scotland international was turned inside out by Berget’s next raid. Celtic were relieved when Rosenberg was unable to get on the end of Berget’s dangerous low cross. It was breathless stuff all round and Griffiths had another sight of goal in the 13th minute, latching on to a long clearance to get in behind the Malmo defence. This time, he skewed his shot wide of Johan Wiland’s left-hand post. But while Celtic had started to edge the possession statistics, they found themselves behind in the tie when Rosenberg levelled the aggregate score in the 23rd minute. Adding to the frustration for Deila was that the goal came from a poorly defended corner kick. It was well delivered from the right by Yoshimar Yotun but Rosenberg was allowed a free run at the ball to flick a powerful close range header beyond Craig Gordon. The Celtic keeper protested he had been impeded by Berget but it was a cheaply conceded goal nonetheless. James Forrest attempted an immediate response for Celtic but his shot from the edge of the box was comfortably gathered by Wiland. In a tie now so finely poised, the last thing Celtic needed were any rash acts of indiscipline such as the one committed by Griffiths seven minutes before half time. He was extremely fortunate to avoid a red card for kneeing Anton Tinnerholm in the groin as he tried to retrieve the ball for a free-kick. Referee Mazic didn’t see the incident and Griffiths escaped with a booking for squaring up to Vladimir Rodic in the aftermath, the Malmo player also receiving a caution. It sparked a dramatic finale to the first half which saw Celtic have every reason to feel aggrieved when they had what should have been an equaliser disallowed. Malmo defender Arnason clearly handled the ball as he contested a Stuart Armstrong corner with Bitton. The Israeli midfielder hooked the ball home from close range in any case but to Celtic’s dismay and bewilderment, it was ruled out, apparently for a foul by Griffiths on Wiland. It might have got even worse for Deila’s side on the stroke of half-time when they were indebted to a stunning one-handed save by Gordon which kept out Nikola Djurdjic’s close-range shot. Celtic were now teetering on the edge of Champions League elimination and began the second half with Kris Commons on in place of Armstrong as they tried to retrieve the situation. They should have fallen 2-0 behind just two minutes after the restart, however, when Rosenberg contrived to slice a simple chance wide from around ten yards. But it was only a temporary reprieve. After Gordon made a fabulous double save to deny Rodic and then Rosenberg, Malmo did double their lead in the 54th minute from the resulting corner. It was whipped in from the left by Rodic for Felipe Carvalho, a half-time replacement for Bengtsson, who flicked a header towards goal which struck Dedryck Boyata before crossing the line. Celtic now needed to score twice without reply to turn the tie around and Deila switched to 4-4-2 in a bid to engineer a recovery, Nadir Ciftci replacing Bitton and joining Griffiths up front. But there was no way back with even the final throw of the dice, with Gary Mackay-Steven replacing Forrest, unable to make any impact. The Celtic players slumped to the turf in despair at the final whistle, the defining match of their season having turned horribly sour. Malmo: Wiland, Tinnerholm, Arnason, Bengtsson (Carvalho 46), Yotun; Rodic (Rakip 82), Adu, Lewicki, Berget (Mehmeti 90); Rosenberg, Djurdjic. Subs not used: Andersson, Vindheim, Molins, Eikrem. Celtic: Gordon, Janko, Boyata, Van Dijk, Mulgrew; Bitton (Ciftci 72), Brown; Forrest (Mackay-Steven 79), Johansen, Armstrong (Commons 46); Griffiths. Subs not used: Bailly, Izaguirre, Ambrose, Rogic.